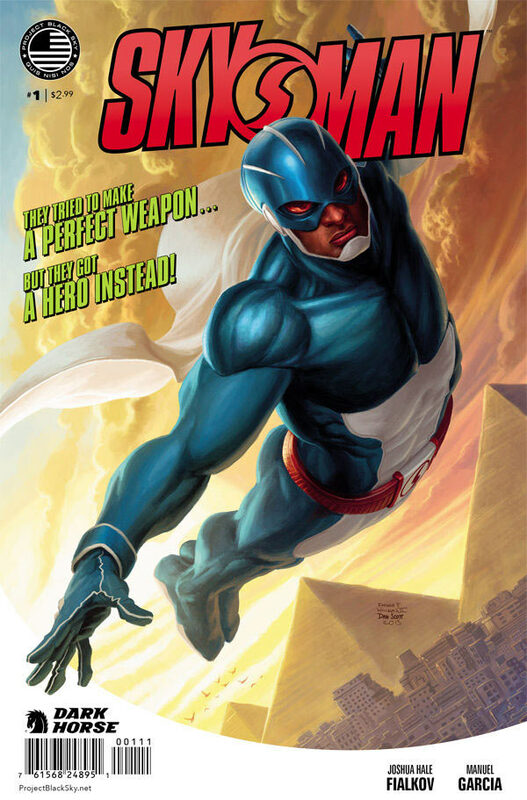 Review: Skyman Issue #1 – Good(?) Intentions that Ended in Racism. Following on the heels of Captain Midnight, Skyman has blasted into its four issue miniseries debut. The colors are bright, the suits are cool, and the government projects are secret. Story-wise, Skyman has potential; however, there’s a plot point that eclipses its accomplishments: a heaping portion of both outright and muted racism. When I first looked at the cover art for Skyman, I was excited. I thought, “Yes! Another cool superhero! And he’s not continuing the obnoxious, repressive over-saturation of white dudes in capes!” But by page seven, my stomach took a turn. Essentially, the setup is that the original Skyman blew a gasket, said a bunch of terribly racist things, and got filmed in the process. So, when the government bureau responsible goes to pick a new Skyman, they look at their team of white boys and say, “Nope! Not gonna carry the neo-Nazi image!” So, they find Eric Reid, a fully-decorated, injured, but well-adjusted war veteran with a fantastic history of service. However, that’s not what the Skyman Program cares about. Instead, they only decide to notice him because he’s black. According to them, the only time they would dare consider his accomplishments and invite him into the program is when all of the white guys are off the board of selection. Now, that’s a nasty message. They make Eric Reid and his “blackness” a Goddamn last resort. I could try to run with the obvious excuses for this: first with the fact that Eric is self-described as a “cripple,” so maybe he wouldn’t be first on the list of recruits. Yet, even then, the Skyman suit HEALS Eric’s spinal injury when it’s activated, so war wounds aren’t an issue for anybody. Also, why in the hell aren’t there any men of color (or women) recruited anyway? Why do they have to seek a black man out like he’s some sort of unicorn? What kind of horrible place is this? Are the recruiters themselves neo-Nazis? 1. Are you being clear about the issue you are presenting? 2. Are you illustrating the negative effects of the issue? Are you lending avenues to empower people on the receiving end of the negative effects instead of making them helpless victims? Can you present yourself as being self-aware enough to communicate satire? In some respects, Skyman #1 can answer these questions well enough. The issue is that racism smeared the Skyman Program: it hurt them, it hurt the races targeted by the slurs, it hurt societal progress, and now they need to prevent any more damaging, skinhead commentary. But, unfortunately, that’s where the satire drops off, and the latent racism begins. Instead of having a diverse program from the start – lending a black superhero his naturally-deserved respect, and selecting him for his outstanding abilities – they pick a man for the color of his skin first and his hard-won achievements second. He is turned into the most ham-fistedly token black guy in all of recent comic book history. And that’s where Skyman ceases to be socially clever and just becomes insulting. It’s infuriating because all of the fire and importance of Eric as Skyman has been undermined by a particularly gross dose of white guilt. Men and women of color have enough weight stacked against them to this day; the last thing they need is to get laden with the projected shame of white people. I just want Skyman to be an awesome comic so badly. The comic book industry is in desperate need of a wider representation of all races and cultures, and thus the flagrant failure of empowering Eric Reid as a badass superhero in his own damn right is an event we cannot afford. I don’t know what Joshua Hale Failkov has in mind for the rest of the story, but it better involve taking Skyman back as an actual person instead of a race card. I really hope the later issues of the miniseries balance out this jarring introduction, turning this series into the amazing story I know it can be. Goddammit, I want to see Eric Reid friggin’ FLY as a character. Incidentally, now is a great time for us in the community to have a discussion about this issue. I would very much like to see you in the comments below.